I'm Heidi from Smiley Guy Designs and I’m here with today’s inspiration post. Now I know Valentine's Day was on Saturday and I hope everyone got to spend it with loved ones, but I just had to make another project using the stamp set from Technique Tuesday. Head over to my blog Smiley Guy Designs for more card details. 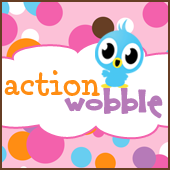 I have had these wobbles for a long time and use them often. I love them. Makes the card come to life.